Your product can only be as good as the people who supply it. It doesn’t matter whether you’re ordering raw materials or finished goods, finding the right supplier can be a game changer in the e-commerce business. Fortunately for you, the days of scouring factories across the country are over. Platforms like AliExpress make it extremely easy to source virtually anything — spare parts, supplies, and finished products. However, finding the right supplier on AliExpress isn’t easy. Which is why we’ve compiled this checklist to help you choose the perfect supply partner on AliExpress. Before you start, it’s important to understand the difference between manufacturers, drop shippers and trading companies before you go about sourcing from China. Manufacturers make products. They operate factories that have materials, machines, and staff to make the product from scratch. Most established manufacturers also have designers who’ll work with you to develop product ideas. You’ll go to manufacturers when you have a product idea and want help turning it into reality. Most manufacturers will ask for a minimum order quantity (MOQ) before starting the manufacturing process. A distributor is a company that buys goods in large batches and sells those goods in smaller batches to retailers or traders. You’ll go to distributors when you want to source large quantities of an existing product and resell it in your home country. For instance, if you want to sell LED lamps in the US, you’ll go to a LED lamp distributor. Drop shipping is a retail fulfillment method where the store doesn’t keep the products it sells in stock. The products are stored by the drop shipper who takes care of fulfilling individual orders on behalf of the reseller. As soon as the reseller receives an order, it is forwarded to the drop shipper for fulfillment. The store never sees the product that is shipped to the customer. You’ll go to drop shippers when you want to run a store but don’t want to keep an inventory or deal with shipping. Trading companies buy multiple kinds of product from different factories and sell to other businesses. The difference between traders and distributors is that the former usually stocks small to medium quantities of a lot of products, while the latter keeps large quantities of a limited range of products. For instance, an electronics trading company might sell everything from mobile phones to LED lamps. A phone distributor, on the other hand, will usually only stock phones of a particular brand or type. Read also: Should You Make, Manufacture, Wholesale or Dropship Your Product? 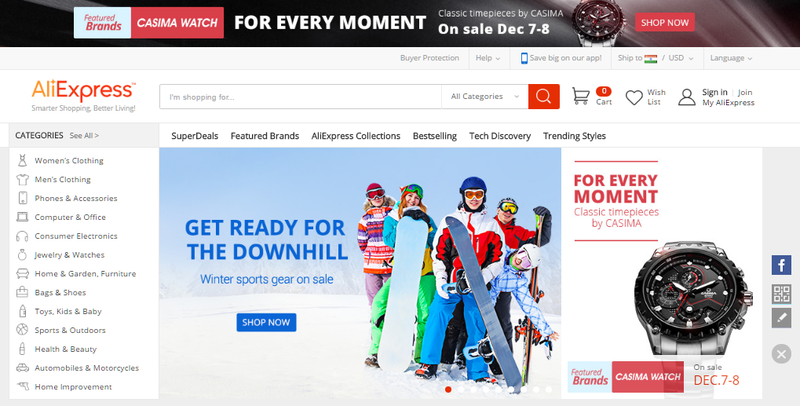 You might be wondering: what is AliExpress and how does it differ from Alibaba? Alibaba is arguably the more famous platform — it is, after all, the name of the founding company. AliExpress, on the other hand, is a relatively new platform and serves a very different clientele. We’ll show you how to choose between the two below. Alibaba is ideal for businesses that want to place large quantity orders to get the cheapest price per unit. You will mostly find manufacturers and wholesalers on Alibaba. Business owners can also have a custom product made by the manufacturers or buy certain types of products they specialize in and private label them under their own brand. There is no shopping cart on Alibaba; you’ll have to work with manufacturers to negotiate a price and minimum order quantity. Use Alibaba if you want to directly work with manufacturers, develop a private label of your product or to place bulk orders at the cheapest price. Because it caters largely to retail buyers, AliExpress doesn’t have as many manufacturers on it. Instead, you’ll find a lot of trading companies and smaller distributors. While you won’t get as cheap rates as on Alibaba, you won’t have to order large MOQs either. This makes it perfect for small and new businesses who want to get started with e-commerce. Your supplier is one of the most important cogs in your e-commerce machinery. A reliable supplier of quality products can give you a massive edge against the competition. However, with millions of competing suppliers on AliExpress, finding the right one can be a daunting (and expensive) task. To make better decisions, follow these 10 guidelines. This is perhaps the most important thing while evaluating AliExpress suppliers. As a rule of thumb buy from suppliers that have 95% and higher positive feedback. The Feedback Score shows the seller’s sales volume and the Positive Feed Rate represents the feedback that supplier has received. A supplier with more than 95% Positive Feedback Rate and 2,000 Feedback Score is considered a reputed seller. This, of course, does not mean that a supplier with a 500 Feedback score can’t be trusted or all suppliers with the 1000+ score are genuine. Think of it as a general measure. Also, note the number of years the store has been in business. 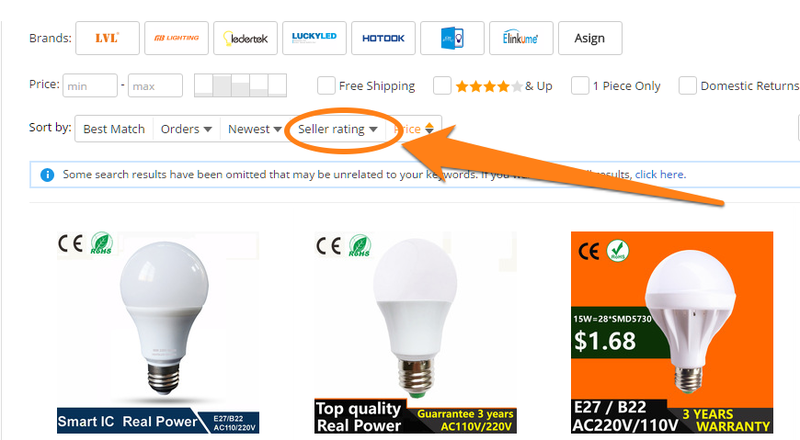 To find top rated sellers, sort products by seller rating. The old adage holds especially true on AliExpress: if it looks too good to be true, then it probably is. When you first land on AliExpress, you’ll be surprised (and excited) to find some products being sold at dirt cheap prices (relative to competitors). These are usually offered by new suppliers with little to no feedback. You have to tread with caution in such cases. Sometimes, the lower prices are because a new seller wants to make a mark in the marketplace. But more often than not, it’s either a scam or you will be compromising significantly on quality. Be sure to compare by different suppliers. If a number of sellers have similar prices for the same product, but one seller has a significantly lower price, take this as an indication that the product is likely not genuine. AliExpress has a handy tool for filtering out very high or very low priced products. 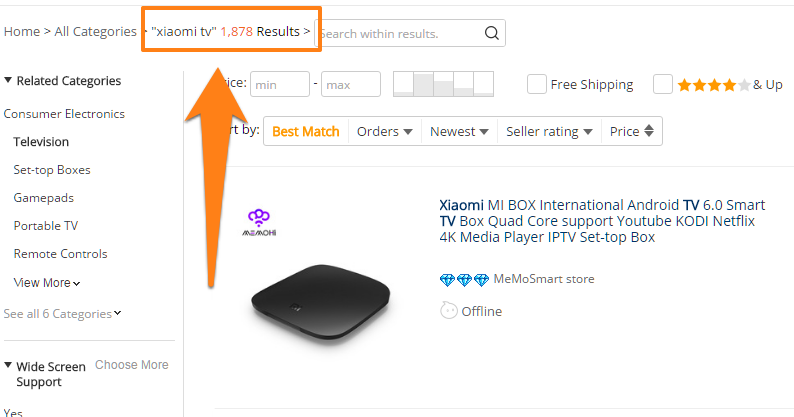 When you hover over the Price bar on the product page, AliExpress will show you how many people bought products in that price range. If very few people are buying products in a low price range, it likely isn’t a very good deal. Unfortunately, fake products are a large problem on both Alibaba and AliExpress. With the number of products on offer, filtering out fake products can be a massive challenge. Most of these would be genuine, but you can never really tell fake from real when you have only a few product images to go by. Just like on eBay, feedback score matters a lot to sellers. Reputed sellers wouldn’t engage in any malpractices that might endanger their feedback score. 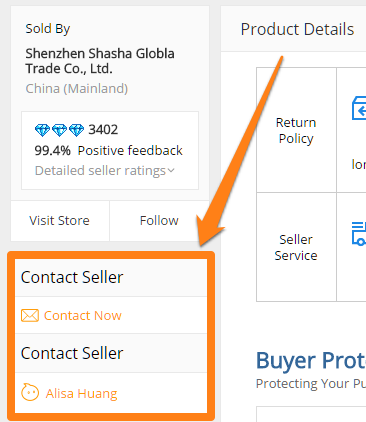 Besides the seller score, you can also check product feedback by clicking on the Feedback tab on the product page. In the above case, both the product and the seller have very high ratings. A seller that offers only one type or brand of products is likely to be more authentic than someone who sells virtually everything under the planet. Again, if the price is too low, it’s likely to be inauthentic. Similarly, also check seller warranties. You can see them in the Seller Guarantees tab on the product page. If you still can’t be sure, try ordering a single product to ascertain quality and authenticity. Proper communication with suppliers is a must since products come directly from them, not AliExpress. The best way is to straight away write to the supplier. Clear all your doubts and ask them any item’s specific details, shipping or delivery questions. After you send the message through chat or messaging, notice how quickly supplier responds to your query. This will give you an idea how responsible the seller is. Remember that your supplier is also your business partner. A seller who can’t respond quickly to your requests or is unreliable in his response time will likely make for a bad partner. Keep local China time (UTC +8) in mind before you do this. 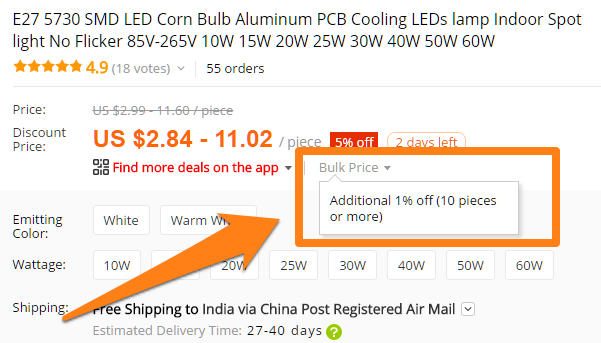 When you’re buying in bulk from AliExpress, most sellers will offer you a small discount for bulk orders. You can see this on the product page under Bulk Price. Understand that this price is completely negotiable, especially if you have a large requirement than the seller’s mentioned bulk price. In the above case, you can likely negotiate a few extra % points for 100+ piece orders. Always negotiate before making a purchase commitment. Never place an order without reading the item’s description no matter how pretty the photos look. Sometimes useful information is included in the details section. Sellers offer their own set of guarantees. When you’re buying a branded item make sure to look for Guaranteed Genuine tag. If the product is still found to be counterfeit, you will get your full refund including shipping cost. Expensive products usually get under the scanner of the custom department. If it happens to you, there is a good chance you will need to pay import duty for the products. Different countries have different rates at which import duties are charged. Keep in check the duty you might have to pay before purchasing the product. Check out Duty Calculator to get an estimate. Email is the preferred mode of communication for most of suppliers. They will likely use Google Translate to translate your emails so make sure you keep the text concise, well formatted and to the point. This will not only help the supplier but also get you better replies. Here is a template that you may consider as a guideline before contacting the suppliers. My name is [Your Name]. I am interested in your [Insert Product Name or Item Code]. 1. What is the price per unit? 2. What is your Minimum Order Quantity (MOQ)? 3. What is your expected delivery time, including customs? I would like to place an order for a sample before placing full order. Can you please send over the sample cost including shipping to the US? I look forward to building a great business relationship with you. Thank you. Things can — and will — go wrong sooner or later. That’s just part and parcel of doing business. Having established processes to deal with such situations can make your job a whole lot easier. Unfortunately, all the due diligence in the world can’t protect you from poor product quality. It’s not unusual for sample products to be very different from the final product. In such situations, you can rule out litigation — American/European court judgments don’t apply to Chinese companies. Also understand that if you’ve already made the payment, you will have very little leverage over the seller. This is particularly true for large sellers with lots of feedback — the odd bad review isn’t going to impact them much. Ask if it is a manufacturing error: Often, poor product quality is because of a one-off manufacturing defect. Sometimes, it’s also because the manufacturer is in the process of upgrading to new machinery. In such cases, sellers might be able to make up in the next order. Hire a third-party inspection company: Because of quality risks, a number of businesses hire third-party inspection companies in China to ensure product quality. Google third party inspection China to see a list of such companies. 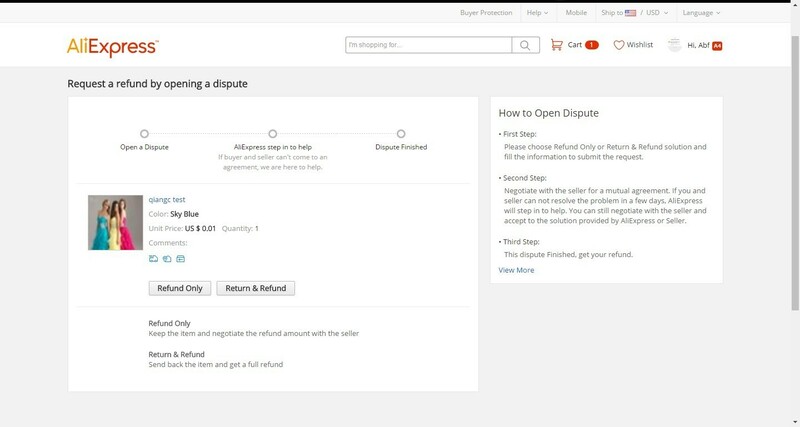 AliExpress’ Buyer Protection will give you 60-days to get a refund or start a dispute. You can do this by going to the order under My Orders and clicking on Open Dispute. If this doesn’t work, you can escalate the dispute straight to AliExpress. Delivery times on AliExpress vary wildly depending on the seller, the product type and the country it is being shipped to. For most smaller items, AliExpress offers its own shipping for free. Track order status: Obviously, the first step — check whether the order is in China, in your country, or en-route. You can do this by going to My Orders, then click on Track next to your order name. Check if the order is stuck in customs: Packages being held at customs is the usual culprit in shipping delays. If this happens, customs will notify you via post of your shipment and tell you how you can retrieve it. This can add several days to the usual delivery time. Most courier tracking services will tell you when a package has reached Customs. Ask the seller for guidance: If you’re shipping products to Europe or USA, most sellers would already be familiar with shipping to your country. Ask them for guidance as to what could be holding back the delivery, and if there is anything you can do to speed things up. Packages being stuck in customs is a routine complaint of anyone who imports from China. The customs in some countries is particularly notorious for holding up packages. Your shipping service provider should be able to tell you when the package is in customs. After this, customs will send you a notification (in writing) as to why your product was held up and what you can do to get it released. Ask for a bill of lading: Ask the seller to furnish a bill of lading to prove that the package has, indeed, left the seller’s warehouse. Contact shipping service to confirm the goods arrival in your home country. In the US, if your carrier fails to inform you within 15 days of the goods arrival (and you fail to act on customs communication), your package will be shifted to a General Order Warehouse (GO). This can make retrieving the items expensive and time-consuming. Understand that this is a very subjective issue — customs procedure vary from country to country. Refer to your country’s customs office to learn more. Most sellers on AliExpress accept a massive number of payment options. Since AliExpress offers its own Buyer Protection, you are secure against any payment fraud. Within the 60 days of Buyer Protection, you get full refunds in case of non-receipt of items. In case you do encounter any issues, you can open a dispute to get refunds. To do this, log into your buyer panel and locate your order under My Orders. You can’t use PayPal on AliExpress. Unless suppliers have their own private PayPal account, so they could send an invoice with item description and price. AliExpress has its own credit card payment system, which resembles Paypal in many ways and offers the same security. Also if you use a bank transfer, debit cards or the Western Union, you have no option other than relying on AliExpress. Intellectual property theft is a major issue in China, so it shouldn’t be surprising if you find your unique idea copied by a supplier. Unfortunately, Chinese law makes it next to impossible to enforce any patents or get any redressal for IP theft. Consider that even Apple isn’t secure from this problem. The best you can do is to open a dispute (see above) and request AliExpress to remove the seller. This, however, will still not stop your IP theft. Consider this part of the risk of doing business in China. 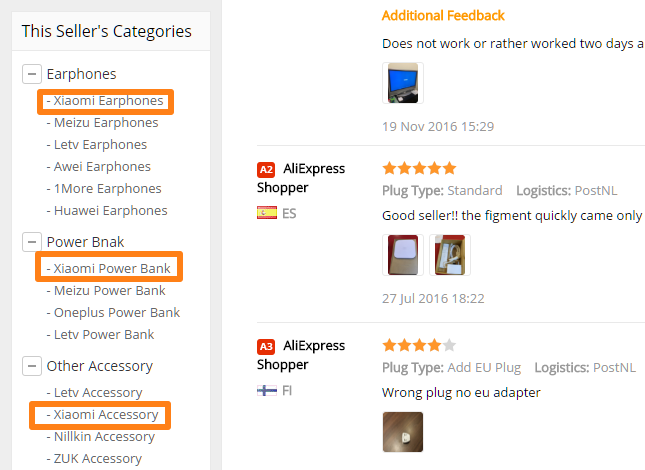 AliExpress isn’t perfect, but it does have a lot of advantages over sourcing products locally. For one, you get access to a massive inventory with no MOQs. You also get extremely low prices, including free shipping on most items. On the downside, you will have to contend with communication issues and the occasional seller dispute. To mitigate this problem, AliExpress offers robust buyer protection and an easy to use communication system. 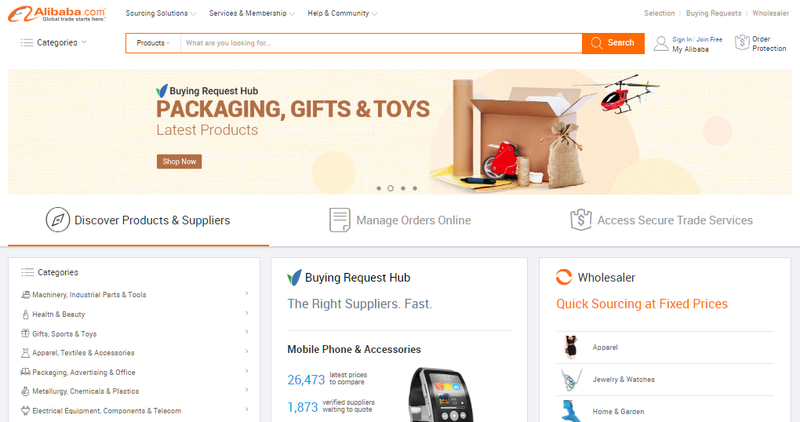 On the whole, you’ll find AliExpress to be a very valuable partner when sourcing suppliers for your e-commerce store.